Mighty centaurs struggle over the catching of a fish, in the process ejecting a vertical spout of water. 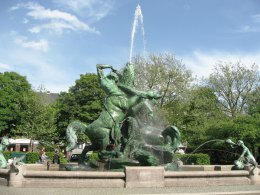 In indignation, a triton and mermaid on the long side of the fountain direct their jet of water at the fighting centaurs. Here we have waterworks as in ancient Rome. The immense construction, made of copper sheeting only 2 mm thick, was formerly supported by an iron scaffolding. This corroded over time so that the stability of the fountain was called into question. 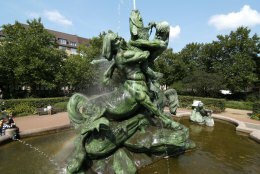 In exemplary cooperation between the Hamburg Monument Foundation together with private sponsors, in particular the firm Aurubis AG, it proved possible to salvage the fountain and restore it to Altona.